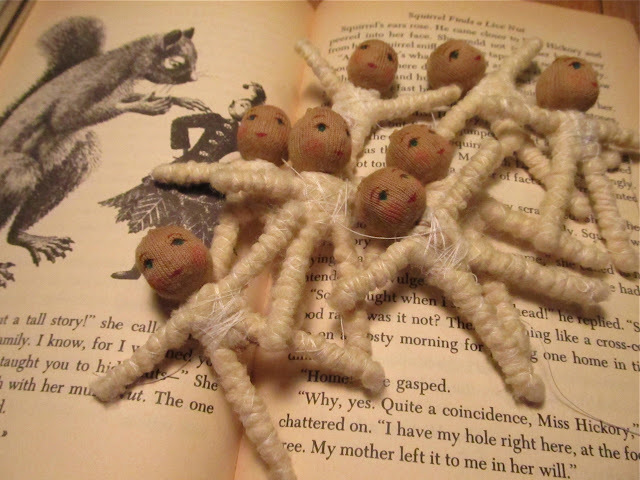 For today's WIP I have a pile of tiny pin dolls, each less than 3 inches tall, on one of my favorite doll books...Miss Hickory. Have you read this one? It's such a sweet and gentle story. I have many favorite books about dolls, Hitty: Her First Hundred Years, The Hidden House, Big Susan , The Mennyms, The Doll People, all the wonderful Lonely Doll stories, and of course the Raggedy Anne & Andy books. Do you have a favorite that's not on the list? Please do share!! You get so much expression in their little faces. Very sweet. I liked Winnie the Pooh and Pippy Longstocking. I was also really into the old fairy tales like Snow White and Red Rose.